Shock and impact sensors are used to detect and record shock or impact to a product or package. Shock sensors represent a subtype of inertial sensors, which includes accelerometers and vibration sensors. In fact, accelerometers can be and often are designed to measure shock as well as proper acceleration. Shock and impact sensors are designed to detect instances of sudden impact or severe vibration in order to output a value or, in the case of impact switches, activate or deactivate a circuit or device. Shock and impact sensors are used in a variety of applications, some of which are discussed below. Tap detection - Shock accelerometers are frequently employed in tap interfaces, which are integral components of advanced user interfaces. Shock sensors are used to detect the direction of a finger tap and distinguish between a single and double tap. Micro-drive protection - Shock sensors are becoming increasingly prevalent in laptops and other portable devices employing disk drives. Many laptops are fitted with a three-axis shock sensor which detects sudden movements, including free falls and sudden impacts. When the sensor detects vibration or shock which exceeds a predetermined level, it causes the hard disk drive's read/write head to retract from the disk itself, preventing the head from scratching the disk upon impact. Some sensors also cause the drive to shut down completely upon impact. 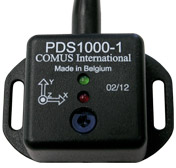 Shipping and handling - Shock sensors can be attached to shipping cases in order to detect and record rough handling. By coupling the sensor with a visual label alerting the handler to the presence of the sensor, companies are able to reduce damage to their shipments and pinpoint exactly when damage does occur. Automotive security systems - Shock sensors are employed in security systems to detect shock related to tampering. If the sensor detects severe vibrations due to tampering, it triggers the vehicle's alarm to deter theft. The video below shows the effects of tampering with a vehicle fitted with a shock sensor. General tamper-proofing - Aside from automobiles, shock sensors are also useful in anti-theft and alarm systems within vaults, strongrooms, safes, and automated teller machines (ATM). Shock sensors share technology types with accelerometers and vibration sensors. Shock may be measured using piezoelectric or piezoresistive means as well as strain gages. Piezoelectric sensors are one of the most widely-used sensor types for shock measurements due to their inherent ruggedness and adaptability. These sensors rely on a piezoelectric material — often a quartz crystal or polycrystalline ceramic material — to sense changes in force. The piezoelectric effect refers to the accumulation of an electrical charge in a material due to mechanical stress. Piezoelectric shock sensors use some type of piezoelectric material in close proximity to a solid mass. When forces are applied to the device, the material responds to the compression or strain provided by the mass. Due to Newton's second law of motion (F=ma), the change in electric charge within the material is equal to the force acting against it, allowing the sensor to effectively measure shock. Piezoresistive sensors are similar to piezoelectric types, except that their output is measured as a change in resistance instead of electrical charge. They are typically manufactured as semiconductors, with separate resistive circuits for each axis to be measured. Each axis includes multiple piezoresistors, which decrease their resistive value when force is applied. Piezoresistive accelerometers intended for shock and impact measurement are typically designed to include semiconductor strain gages for stability. This type of sensor is typically selected for applications requiring the measurement of steady, long-duration shocks. One major disadvantage of piezoresistive sensor use is the likelihood of shock vibrations — which tend to be higher in frequency than normal vibrations or typical acceleration forces — causing the sensor to vibrate at its resonant natural frequency. At best, excitation to resonance causes the sensor to register abnormally high readings, while at worst it can damage or destroy the sensor. The graph below shows the effect of measurement at a sensor's resonant peak; the device's sensitivity at the peak is so pronounced that it can easily cause damage or device failure. Strain gages are often used in addition to or in place of other sensors. When employed separately, they can be strategically located in critical areas of a device to provide additional strain and shock measurements which may not be accurately detected by a primary sensor. The image below shows a basic strain gage accelerometer.